Would I like to sleep here? You bet I would! Yes, I think if I was ever in a position to create my dream home, it would either look like something out of the 1920’s, or 1930’s, or it would look like something from 2030. Alternatively, if some wealthy person wants to buy me a ‘certain mansion’ on Easton Drive, Beverly Hills, and provide me with a self drive car, or something to get me around, I wouldnt say no. But in truth, any home in the LA area, with a vintage feel would probably be heaven for me. Oh fine, nowadays, I’d need cable TV, and internet supplied, but otherwise, in truth, I could probably very happily settle into a 30’s lifestyle, and live that way. Fine, but this blog is more about a couple of more futuristic places to lay my head at night, and in the case of one of them, to make home. https://www.tripadvisor.co.uk/Hotel_Review-g298564-d6028872-Reviews-9_Hours_Capsule_Hotel_Kyoto-Kyoto_Kyoto_Prefecture_Kinki.html appeals to me, simply because of what it is, a pod that you climb into, and sleep in. Fine, I’d like to think of something being done to my mind, and body while sleeping in it, but I would imagine its quite an experience regardless. Sadly, I’m not likely to ever go to Japan in my life, and I have no idea if there are any in the UK, or not? Its probably one of those ‘just once’ things I’d like to do, but it appeals to me no end. Mind, I’d probably want to wear something in silver (ideally metallic silver) while sleeping in it, cant think why! As far as I can guess, its one of the Futuro homes, designed in Finland, in the early 1970’s. Why I say its a guess, is because it looks in remarkably good condition to be one of the originals of those. So whether, its a rare, well preserved one, or whether its an old photo, or a modern take on them, I have no idea. Yes, I know, it looks like a flying saucer. Great, in my eyes at least! As far as I can tell, from all reports, sadly, they dont fly at all, let alone at hyper speed, for deep space travelling. Still, I might be lucky with the one I get to go in, lol? I have no idea how comfortable those things would be to sleep/live in, but I’d love to give it a go, all the same. Yes, I know, humour me, but I’m a huge sci-fi fan, and those 2 designs just appeal so much. 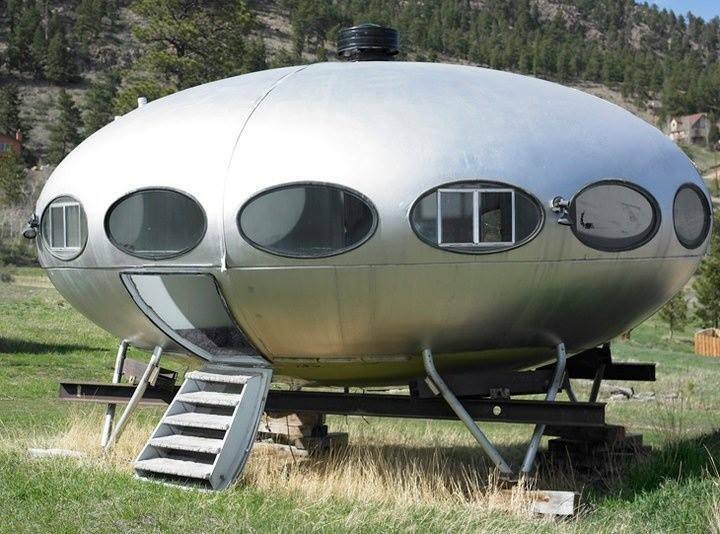 If anyone can give me the chance of a visit/stay in something like that, or knows of a pod I can be brainwashed sleep in, in the UK, please let me know! If at first you don’t succeed, try again! You see, what I did with Google maps, is not specify Rodeo Drive, but just a general hit on Beverly Hills. So back it came, catch the bus at the stop just down the hill from here, and a piece of cake. Yes, that bus did pass through Beverly Hills, but nowhere near where I wanted to be! But rather than admit defeat, or turn around, I stayed on the bus for the ride, and the scenery. Just when I was gasping for a drink, and a bit of lunch, we pull into a shopping centre, I had no idea where. Soon found out, Pacific Palisades, in fact. Nice lunch, then ran into a lovely old man who tried to sell me some kind of exercise equipment, in his shop, when I went walk about, who I had a lovely chat with, but no sale made. Then, just as I was considering getting back home, I spotted this sign for a massage parlour, charging very reasonable rates. So fine, by the time you add on the ‘compulsory’ 15% tip over here, not so cheap, but anyway… Despite the more luxurious seats when flying out here, the length of the flights, plus the wrenching the knee took when running for that plane in Atlanta, well, I was a bit stiff. Note I said, was. I thought Linda was good, but compared to the lady who worked on me yesterday, oh wow! So today, with a more accurate routing from Google Maps, I tried again. Got there fine, eventually, due to road works on Wilshire Boulevard (building metro extension, or something) slowing things down a lot. Yes, it was fun walking around the area, especially given that all of Jean’s homes were in that area, though not down town, as I was. Saw a gorgeous dress in a boutique, she would have loved, but I didnt want to know the price! After that, I headed back into town, and headed out to the Universal Studios lot. No, I did not pay $95 to go where the rides are, nothing of interest to me (at my age) in there. But I had a look round the City Walk shops, before heading back into town, and did my souvenir shopping. Before you ask, and I rip your head off, no, there is very little Golden Age related stuff, Monroe (and Betty Boop, if she counts?) being about the only non modern stars you can find much for. So I’ve got 3 movie stills (Harlow, West, and Brooks), but thats it! Tomorrow, daytime, not sure. I had an idea of going down to Long Beach, on the Metro, but then realised its quite a trip, and I pretty much have to have everything I can pack, packed before I go out tomorrow evening, as I have an early start on Saturday. Yes, sadly, the holiday is almost over. 😦 I am out tomorrow evening, a ‘Women In Media’ evening, and a film from 1940, but its going to be a latish night, so…ah well, I’ll catch up on sleep Sunday, and Monday! So just saying, this is your last Hollywood blog, the tale of tomorrow, and Saturday will get posted at some point after I get back. The video, well, when you mention Beverly Hills, this TV theme tune comes instantly to mind!